Perfect for photographers: The Desigual CAMARAS shirt. $105.95. Spring 2016. Desigual LOOK jean jacket. Mix of new and faded denim. $169.95. Spring 2016. Desigual DALLAS shirt. A combination of indigo and denim. 100% cotton. Slim fit. $159.95. Spring-Summer 2016. Desigual JULIO shirt. $125.95. Spring-Summer 2016. Desigual CAMARAS shirt. $105.95. Spring 2016. Desigual TROLE shirt. $105.95. Bright & bold. Spring-Summer 2016. 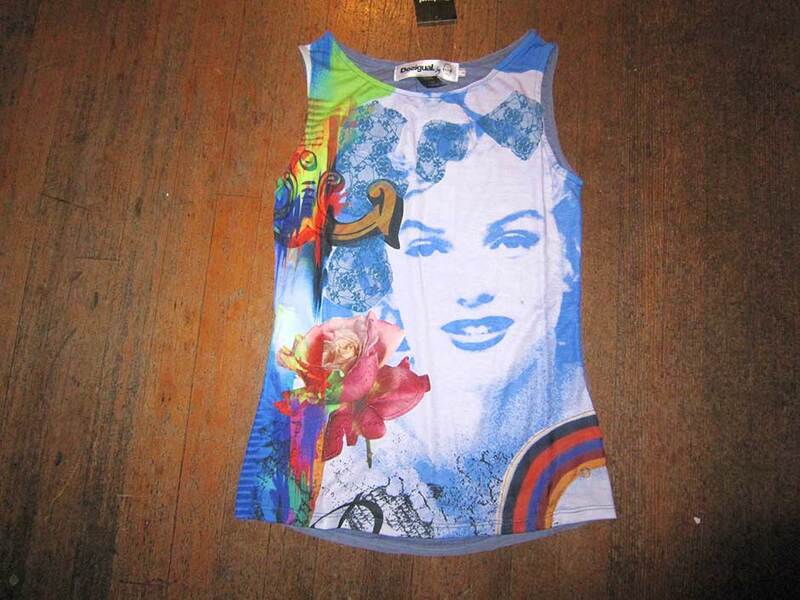 Desigual CARTAS shirt with pin-up girl playing cards. $109.95. Spring-Summer 2016. Desigual ALLEN shirt. $115.95. Spring-Summer 2016. Desigual LOOK jean jacket. A mix of new and faded denim. $169.95. Back of Desigual LOOK jean jacket. Spring-Summer 2016. Desigual LUIS shirt. $115.95. Spring-Summer 2016. Desigual DALLAS shirt. $159.95. A mix of indigo and denim. Spring-Summer 2016. Already a Top 10 best seller worldwide. Desigual CAI shirt. Stripes & plaid. $129.95. Spring-Summer 2016. Desigual GERARD shirt. The polka dots are made up of tiny words (one says “curious”). $109.95. Desigual BILL shirt. $115.95, minus 30% off. Fall-Winter 2015. Desigual MIXX plaid lumberjack flannel shirt. $135.95, minus 30%. Go bold or go home! Fall-Winter 2015. Desigual ADRIEN blazer with zip-up hoodie inside. $239.95. Spring-Summer 2016. Desigual ADRIEN cotton blazer with hoodie. $239.95. Spring-Summer 2016. Desigual WINNER overcoat with coloured buttons and removable knitted collar and button-up quilted vest liner. $365.95, minus 40% ($219). Fall-Winter 2015. Desigual WINNER long black overcoat. It also has a purple polka dot lining. $365.95, minus 40% (now $219). Fall-Winter 2015. Desigual JOHN SEATRAVEL T-shirt with button cuffs. The sailor’s face & beard are made of appliquéd different fabrics and textures. $109.95, minus 20% off (now $87.95). Fall-Winter 2015. Desigual JOHN SEATRAVEL T-shirt with plaid sleeves & button cuffs. $109.95, minus 20% off. Fall-Winter 2015. Desigual DECONSTRUCTED t-shirt. Angel also has the green corduroy pants with suspenders. Fall-Winter 2015. Desigual CROMITOMI shirt. $125.95. We also have this shirt in blue. Desigual DANI shirt. $135.95, minus 30% off. Fall-Winter 2015. Desigual MIX winter coat. Was $295. Now $177 — 40% off. Fall-Winter 2015. Desigual BLUE WAVE winter coat. $309.95, minus 40% — now $186. Fall-Winter 2015. Desigual LUCA HOODIE. $165, minus 30%. Only one left: Size Medium. Fall-Winter 2015. Angel also has a 30% off sale on the other Spanish brands in stock: Smash!, Paramita & Compañía Fantástica. Today’s video is Coldplay with a new song Hymn for the Weekend: Coldplay got mixed reviews for its Super Bowl 2016 halftime show on Sunday — some say Bruno Mars and Beyonce stole the show — but at least Chris Martin of Coldplay wasn’t lip-synching and got the crowd singing with him. Of course, we loved the colour of the stage show and the dancers on the football field with coloured umbrellas. And no, despite some speculation that he was wearing Desigual, he wasn’t. By the way, that’s Beyonce in Coldplay’s new video, which has caused some controversy. This entry was posted in Desigual, Desigual for men and tagged Desigual for men for Valentine's Day 2016, Desigual in Canada, Desigual men's shirts, Desigual Spring-Summer 2016 collection for men has arrived at Angel Vancouver Canada, Gastown, We ship Desigual in Canada. Bookmark the permalink.